Presenting Wu Zhongyuan, a resourceful inventor who easily joins the ranks of his creative Eastern counterparts. 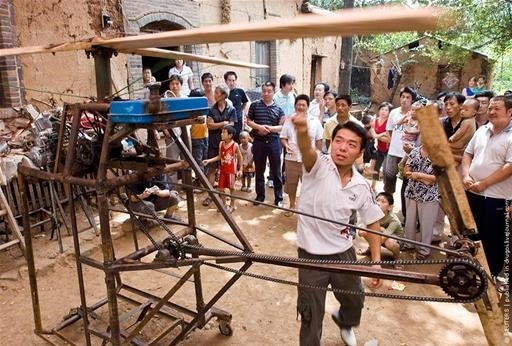 Zhongyuan has crafted a helicopter out of an old jungle gym, a motorcycle engine, and wooden rotors cut from an elm tree. The helicopter cost him roughly $1600 to make, and supposedly elevated him 2600 feet above ground before the authorities ordered him down. 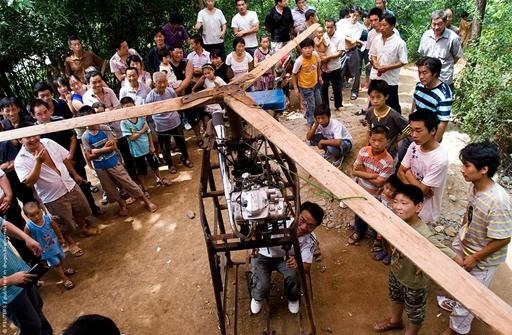 "Zhongyuan has no formal aviation training, but still managed to assemble the rickety beast using a recollection of middle school physics courses and "relevant knowledge found while surfing the Internet via his mobile phone." 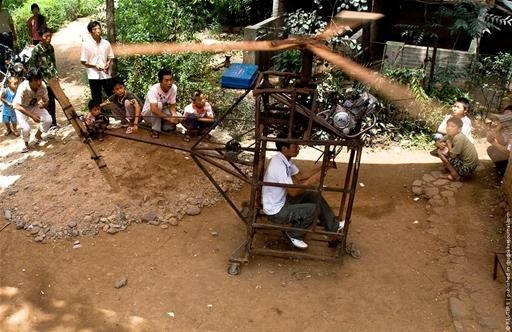 https://www.youtube.com/watch?v=l422VlRE4xs here is a chinese homemade helicopter, doesn't look like same guy. I do not see any of the controls necessary for flight, just saying.